capacity of 180 students. The institution has since grown to an intake strength of 780, and now offers undergraduate courses in seven disciplines of engineering, as well as postgraduate degrees, such as the Master of Computer Application degree and the Master of Business Administration. It is one of the premier most institutions in Central India and ranks among top 50 engineering institutions in India. The Institute is managed by a Board of Trustees. The Trust creates a Governing Body consisting of its representatives, the All India Council for Technical Education (AICTE), the state government of Chhattisgarh, the affiliated Chhattisgarh Swami Vivekanand Technical University (CSVTU), industrialists, senior bureaucrats, management experts, peoples' representatives, and notable social workers. All courses offered by the Institute are approved by the AICTE. 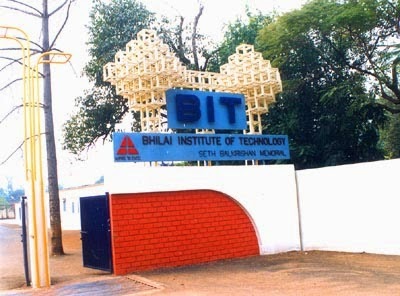 BIT is an institutional member of Indian Society for Technical Education (ISTE), Institution of Engineers (IEI), Confederation of Indian Industry (CII), Institute of Steel Development and Growth (INSDAG), the National Human Resource Development Network, and the American Information Resource Centre, Mumbai. The Institute is a high-ranking university in India.The updated version of the quality management system ISO 9001:2000 is installed in the Institute by the International Certifying Authority M/s KVQA, of Norway. “Putting in well directed and honest efforts to create peace, prosperity and growth for all stakeholders by exhibiting team work, commitment and zeal to excel in all our endeavors and striving to be the best”. To become one of the Premier Technical and Management Educational Institutions in the Country, delivering excellent professional education, creating value based globally competitive professionals and achieving excellence in all our endeavors including Consultancy and R&D. » M.E. / M. Tech. BIT-Durg is located at the threshold of Durg city beside NH-6 (GE Road) in Chhattisgarh state, India. The whole establishment is spread over 62 hectare of land, in Bhilai House opposite to the Circuit house.Its proximity to Durg bus depot and Durg railway station facilitates fast commuting. Additionally, it is connected to each and every corner of Bhilai-Durg agglomeration through various means of transportation such as minibuses, minidors, auto rickshaws, etc.